What could be better than today's 20% off Tabletop Sale? A chance to win our Jade Drops Platter! Generously sized, and featuring a pattern of raised jade-green discs bordered in an antique copper color, this piece is a beautiful addition to any home. To enter, simply share this blog post on your Facebook page, then come back here and leave a comment with a link to your post. A winner will be chosen at random and notified May 24th. Good luck! 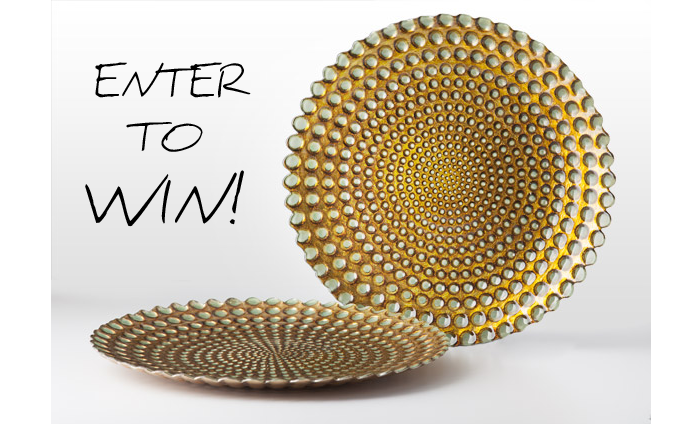 Congratulations Elizabeth, you've won the Jade Drops Glass Platter! Please email your name, address and phone number to shopblog@artic.edu.